The Models 5012 and 5012-HT Piezoelectric Accelerometers are ideal units for general shock work. The unique design of the piezoelectric seismic system ensures that the units have minimum spurious response to mounting torque, body strains, cable vibration, cable whip, pressure variations and most heat transients. The units incorporate a shear crystal-mass assembly, which ensures that the sensor is insensitive to environmental inputs such as base bending and thermal transients. The sensing element is electrically isolated internally from case ground by means of an inner housing to reduce spurious pickup of ground loop currents. 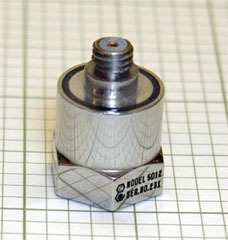 These sensors feature a 10-32 top connector and are provided with a 10" low-noise coaxial cable. The Model 5012-HT will operate in environments up to +500 Deg. F.